Annual Flowers & Accent Plant? When searching for a Tampa landscaping company that can handle all your landscaping needs, look no further than Evergreen Total Landscape. We have been serving the Tampa Bay area since 1983, and what has set us apart since our founding is an unrivaled commitment to customer service. We pride ourselves on being a landscaper that is proactive rather than reactive, and we make the effort to build personal relationships with our customers and provide active management for properties we service. As a part of our Tampa commercial landscape maintenance package, we repeatedly check our job sites after work has been completed to ensure we quickly fix any problems that may arise. We also provide our commercial customers with monthly irrigation inspections to check for breaks, cracks, and other sprinkler system problems. 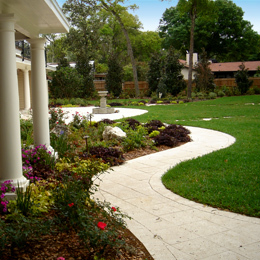 This active Tampa landscaping management can make the life of any property manager much easier. During the holiday season, we offer our Christmas light decoration and installation package. This includes professional grade materials and custom installation. We also inspect every house we decorate twice a week to make sure everything is functioning properly and you continue to be the envy of the neighborhood. In addition to being proactive, our Tampa landscaping services are also specifically designed to suit the individual needs of our customers. For Tampa landscaping design and installation, we send our experienced and friendly certified designer out to work with you and create a plan that takes every existing landscape condition into consideration. In addition to figuring out which plants thrive best for your situation, we also evaluate long term growth habits, sun and soil conditions as well as overall compatibility. This ensures that one species doesn�t grow too large and overshadow the others � or not grow at all � and keeps the landscape design looking beautiful over time. As part of our Tampa commercial landscaping maintenance service, we conduct a soil analysis so we can pinpoint exactly which type of fertilizer will optimize the growth of your plants. We also use state-of-the-art practices when it comes to lawn and ornamental pest control and offer a biological pesticide as well as the traditional chemical method. This natural pesticide is actually an organism that devours pests and their accompanying eggs without damaging plants, so there is no need to arrange for sprayings year after year. Call or e-mail us today for more information on how our many commercial and residential landscaping services can benefit you or to set up an appointment. Chose Evergreen Total Landscape today, and discover why our customers love us. We happily serve customers in Tampa, St Petersburg, Clearwater, Lakeland, and surrounding cities.